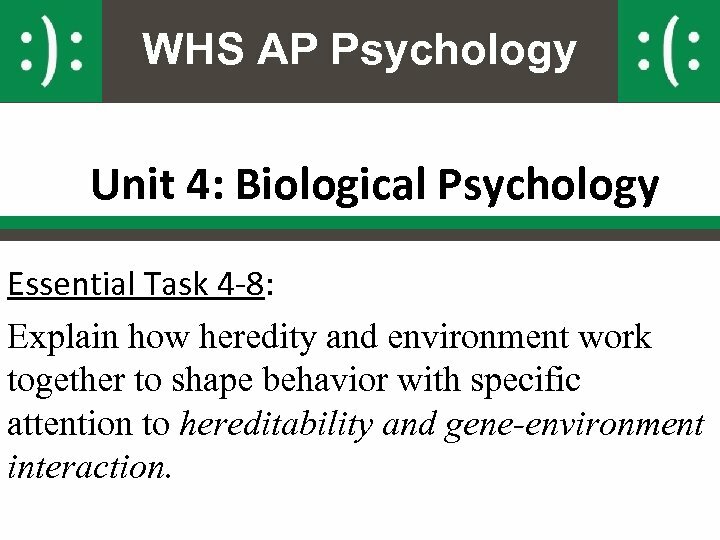 WHS AP Psychology Unit 4: Biological Psychology Essential Task 4 -8: Explain how heredity and environment work together to shape behavior with specific attention to hereditability and gene-environment interaction. 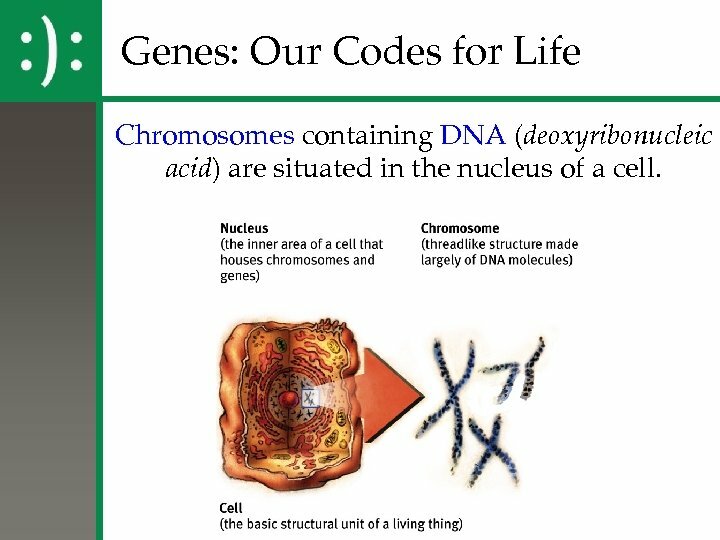 Genes: Our Codes for Life Chromosomes containing DNA (deoxyribonucleic acid) are situated in the nucleus of a cell. 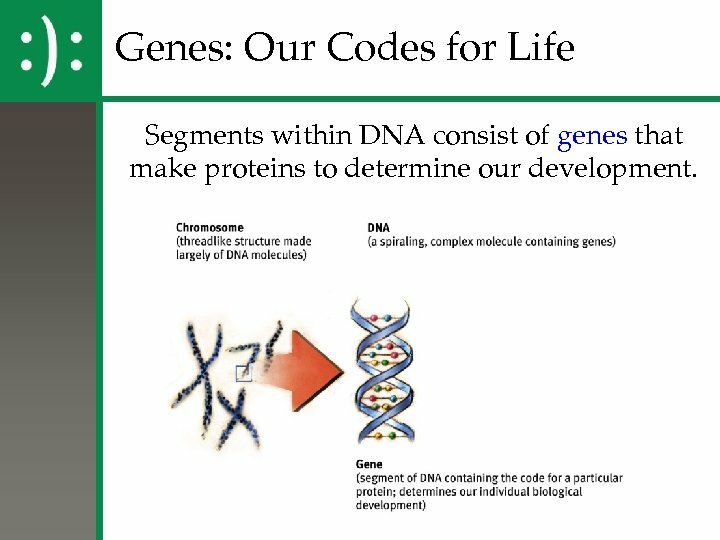 Genes: Our Codes for Life Segments within DNA consist of genes that make proteins to determine our development. Genome is the set of complete instructions for making an organism, containing all the genes in that organism. 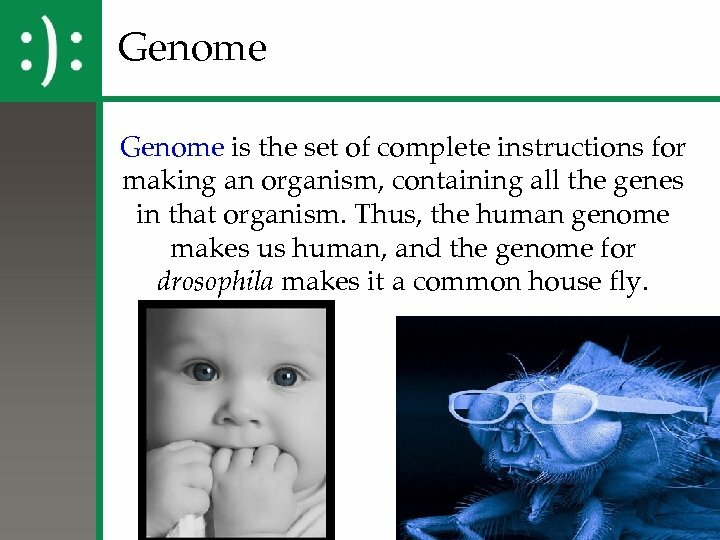 Thus, the human genome makes us human, and the genome for drosophila makes it a common house fly. 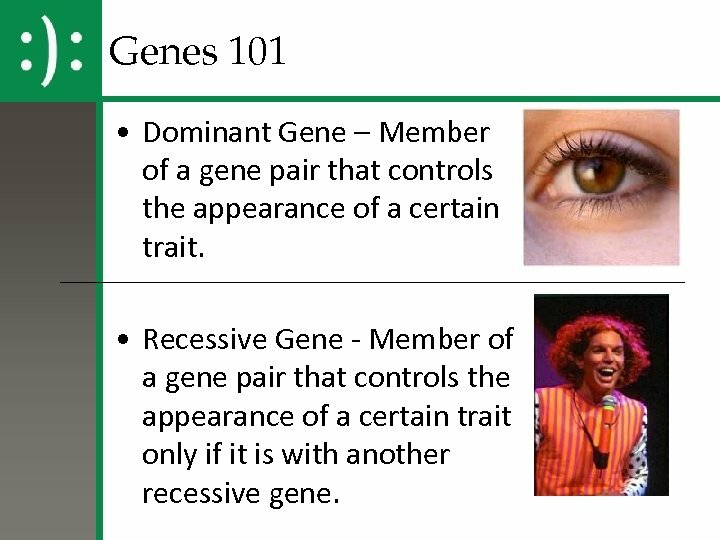 Genes 101 • Dominant Gene – Member of a gene pair that controls the appearance of a certain trait. 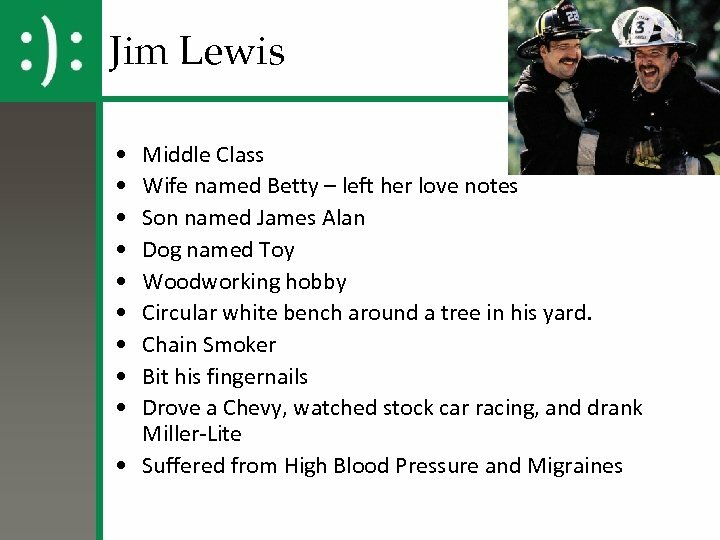 • Recessive Gene - Member of a gene pair that controls the appearance of a certain trait only if it is with another recessive gene. 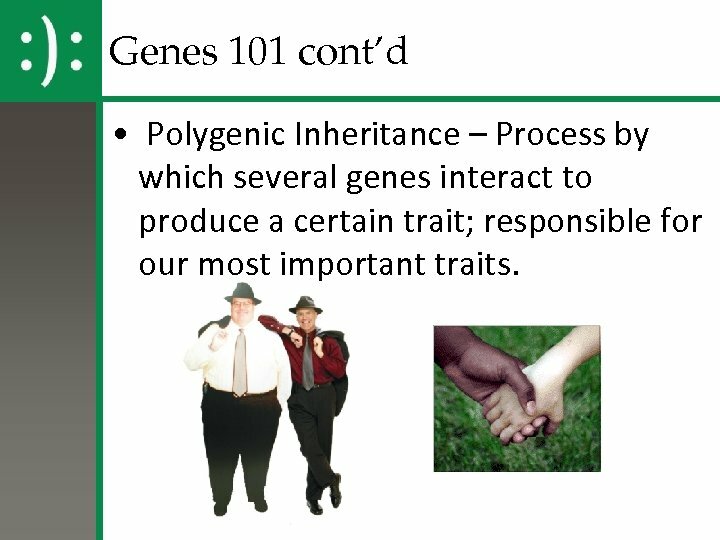 Genes 101 cont’d • Polygenic Inheritance – Process by which several genes interact to produce a certain trait; responsible for our most important traits. 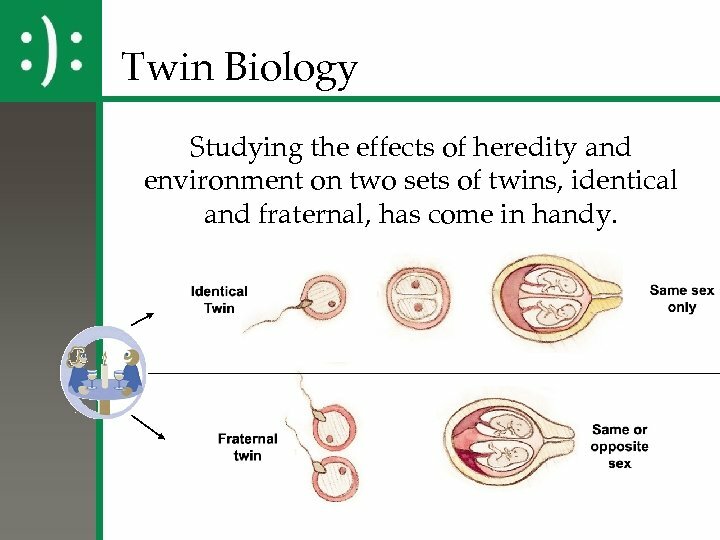 Twin Biology Studying the effects of heredity and environment on two sets of twins, identical and fraternal, has come in handy. 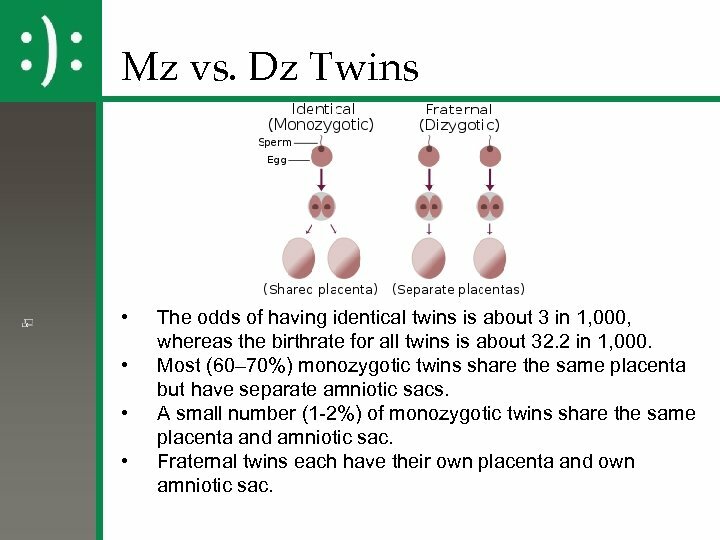 Mz vs. Dz Twins • • The odds of having identical twins is about 3 in 1, 000, whereas the birthrate for all twins is about 32. 2 in 1, 000. Most (60– 70%) monozygotic twins share the same placenta but have separate amniotic sacs. A small number (1 -2%) of monozygotic twins share the same placenta and amniotic sac. Fraternal twins each have their own placenta and own amniotic sac. 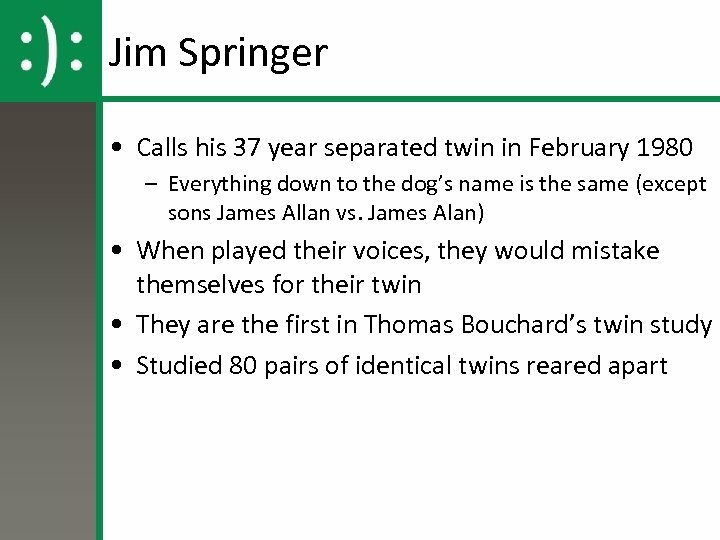 Separated Twins Critics of separated twin studies note that such similarities can be found between strangers. 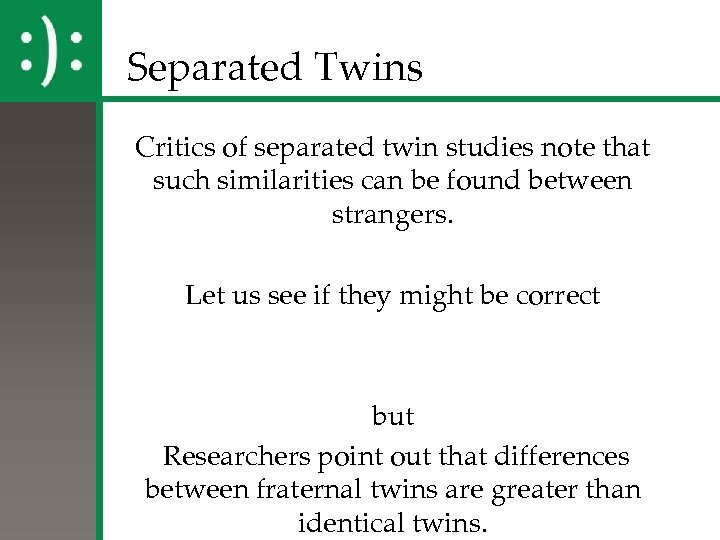 Let us see if they might be correct but Researchers point out that differences between fraternal twins are greater than identical twins. 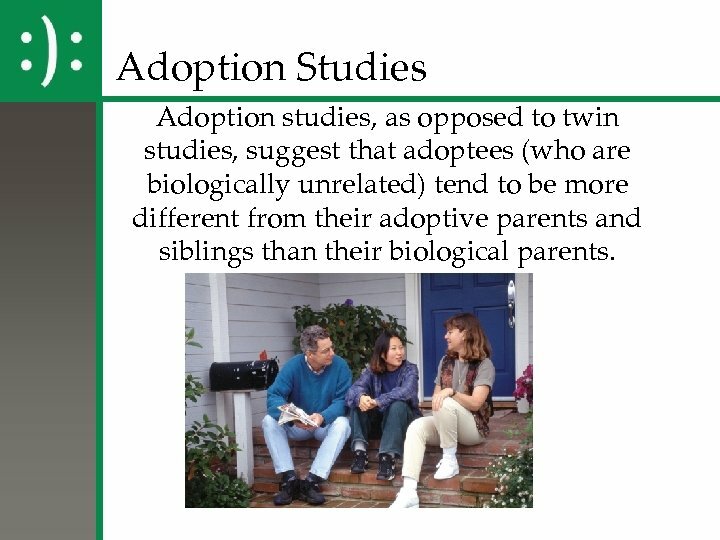 Adoption Studies Adoption studies, as opposed to twin studies, suggest that adoptees (who are biologically unrelated) tend to be more different from their adoptive parents and siblings than their biological parents. Where is the environment? 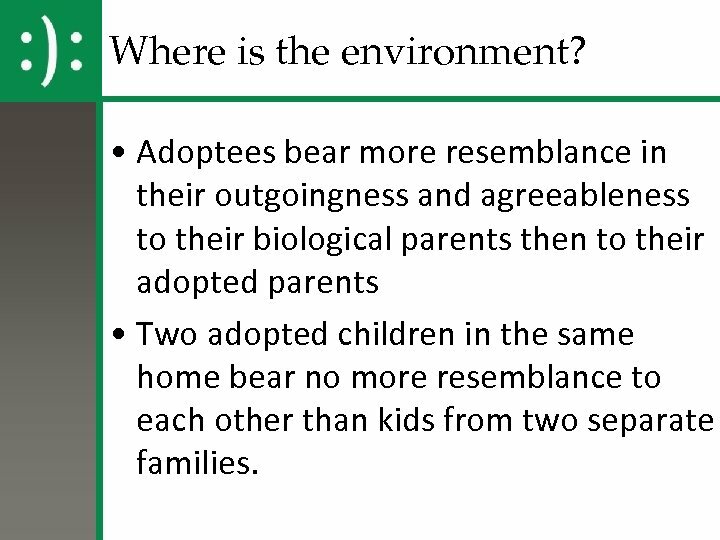 • Adoptees bear more resemblance in their outgoingness and agreeableness to their biological parents then to their adopted parents • Two adopted children in the same home bear no more resemblance to each other than kids from two separate families. 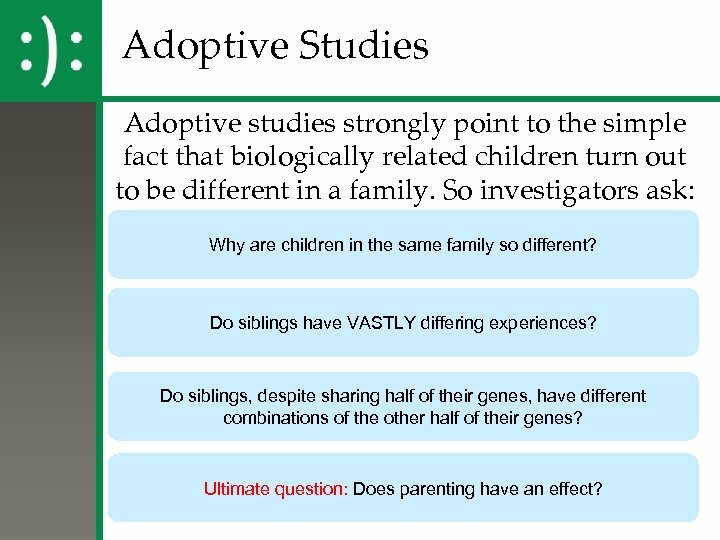 Adoptive Studies Adoptive studies strongly point to the simple fact that biologically related children turn out to be different in a family. 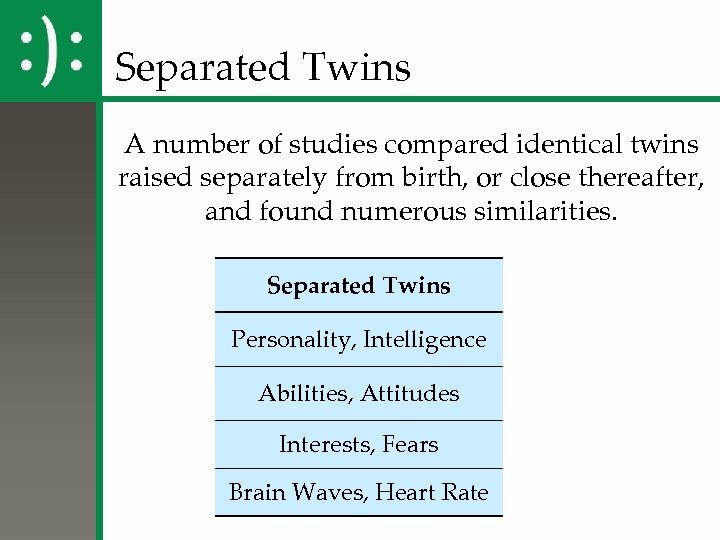 So investigators ask: Why are children in the same family so different? 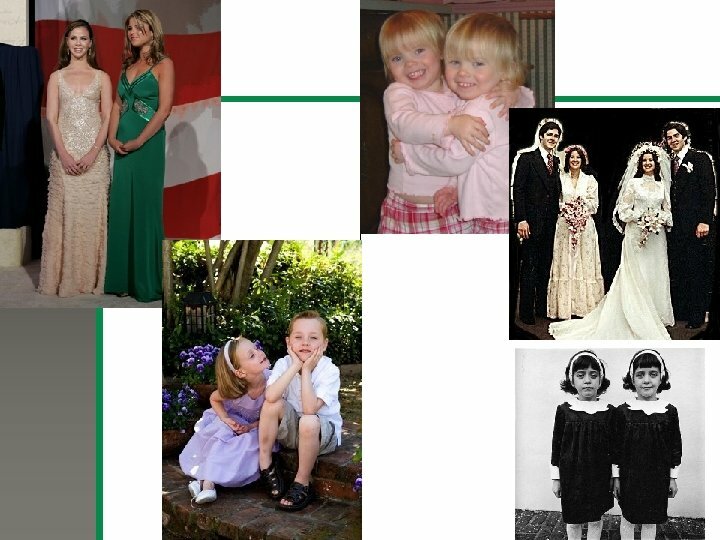 Do siblings have VASTLY differing experiences? Do siblings, despite sharing half of their genes, have different combinations of the other half of their genes? Ultimate question: Does parenting have an effect? 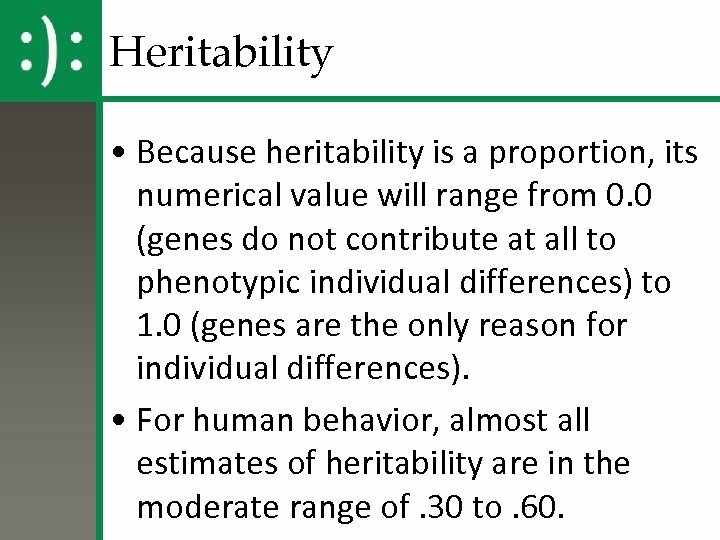 Heritability • Because heritability is a proportion, its numerical value will range from 0. 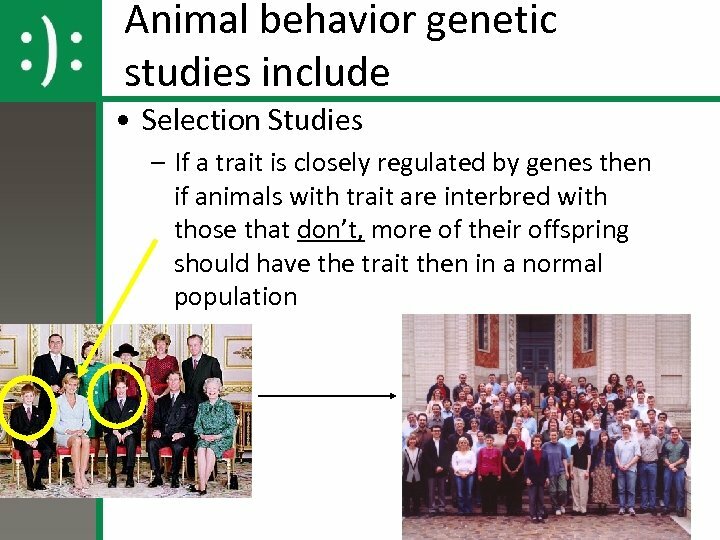 0 (genes do not contribute at all to phenotypic individual differences) to 1. 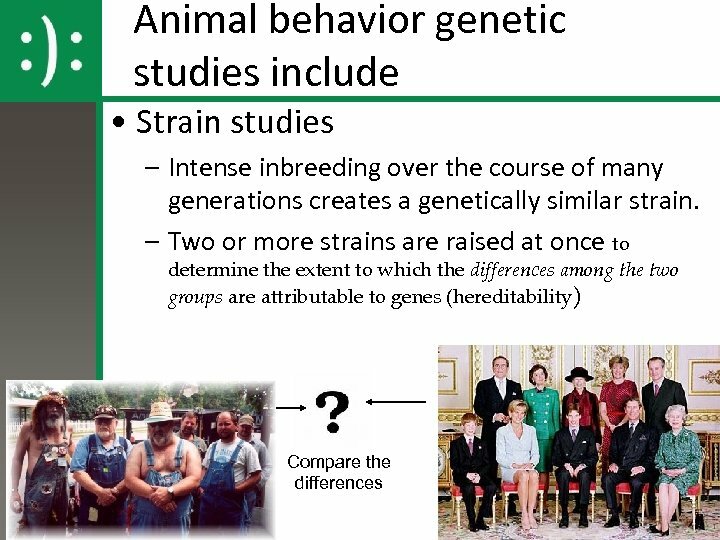 0 (genes are the only reason for individual differences). 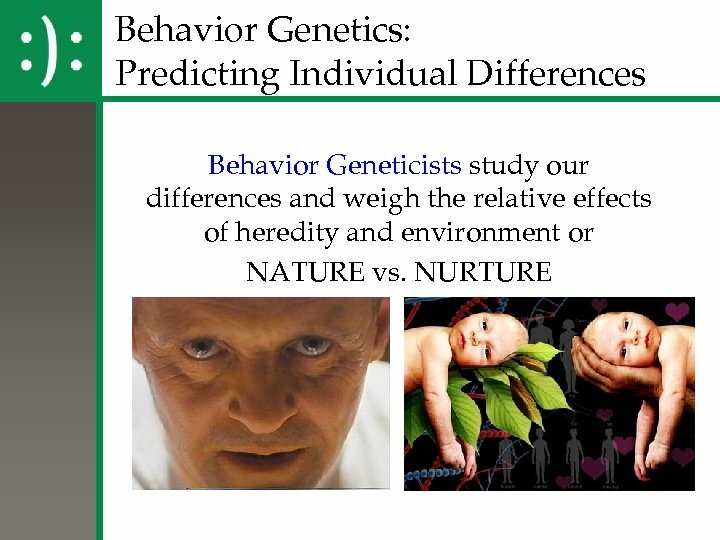 • For human behavior, almost all estimates of heritability are in the moderate range of. 30 to. 60. 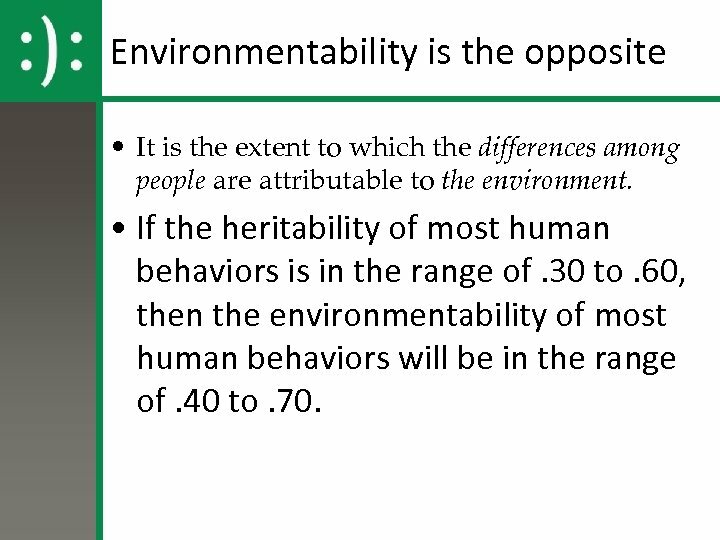 Environmentability is the opposite • It is the extent to which the differences among people are attributable to the environment. 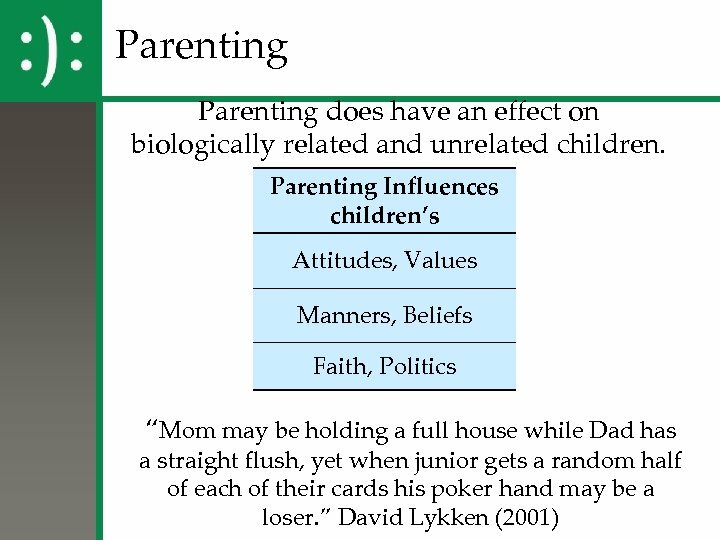 • If the heritability of most human behaviors is in the range of. 30 to. 60, then the environmentability of most human behaviors will be in the range of. 40 to. 70. What can you say? 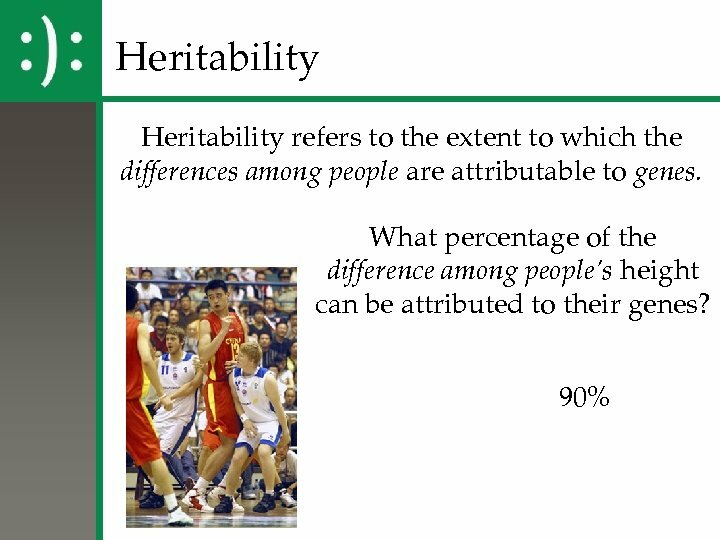 • Heritability and environmentability are population concepts. 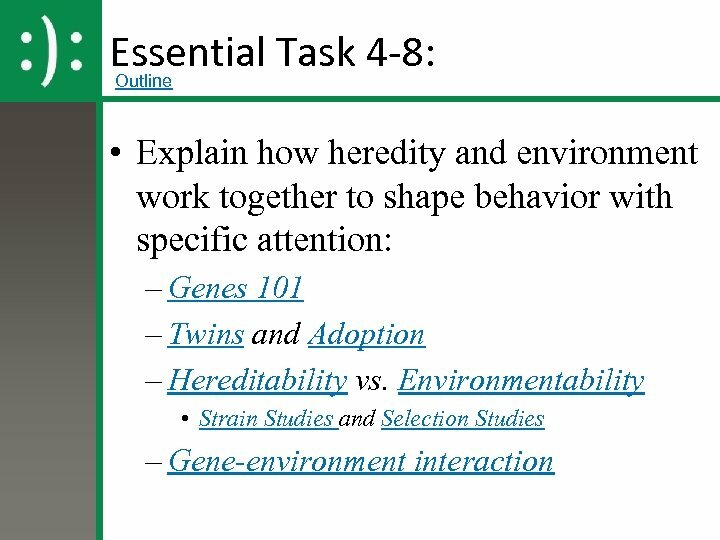 They tell us nothing about an individual • A heritability of. 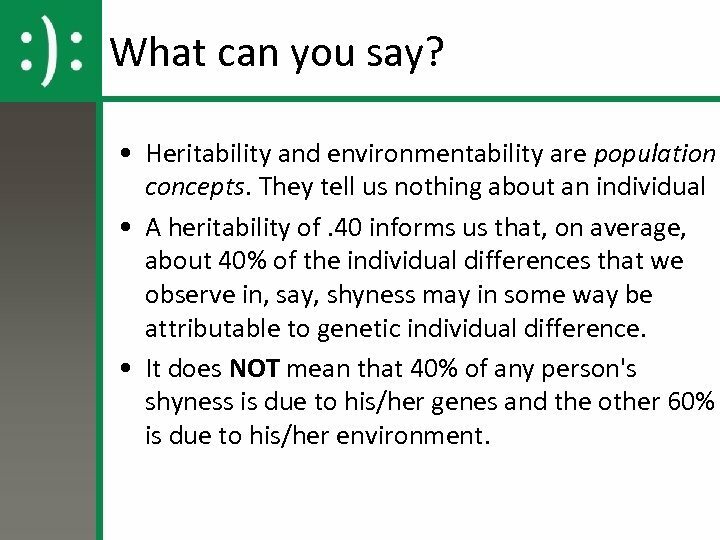 40 informs us that, on average, about 40% of the individual differences that we observe in, say, shyness may in some way be attributable to genetic individual difference. • It does NOT mean that 40% of any person's shyness is due to his/her genes and the other 60% is due to his/her environment. 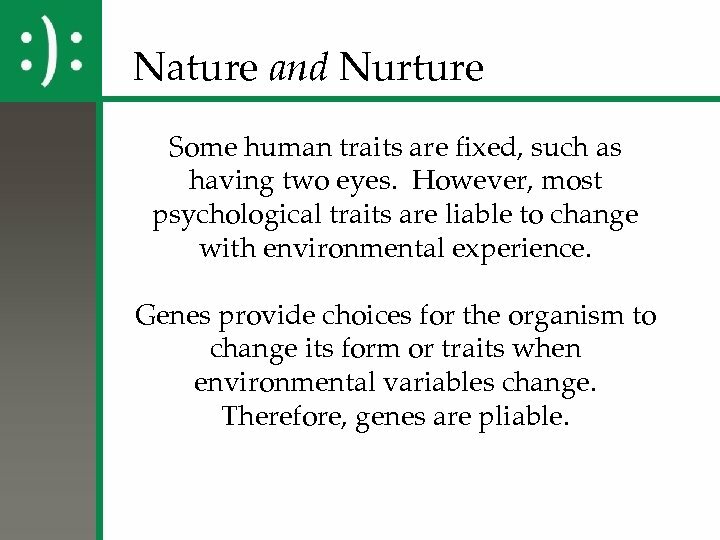 Nature and Nurture Some human traits are fixed, such as having two eyes. 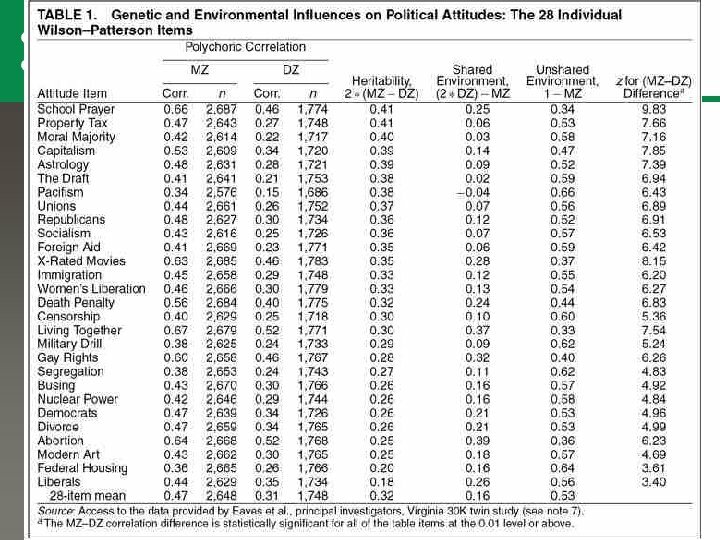 However, most psychological traits are liable to change with environmental experience. Genes provide choices for the organism to change its form or traits when environmental variables change. Therefore, genes are pliable. 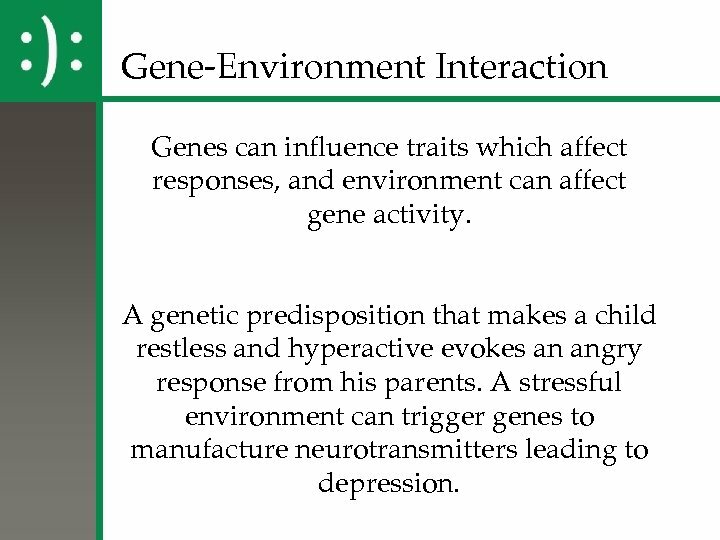 Gene-Environment Interaction Genes can influence traits which affect responses, and environment can affect gene activity. A genetic predisposition that makes a child restless and hyperactive evokes an angry response from his parents. A stressful environment can trigger genes to manufacture neurotransmitters leading to depression. 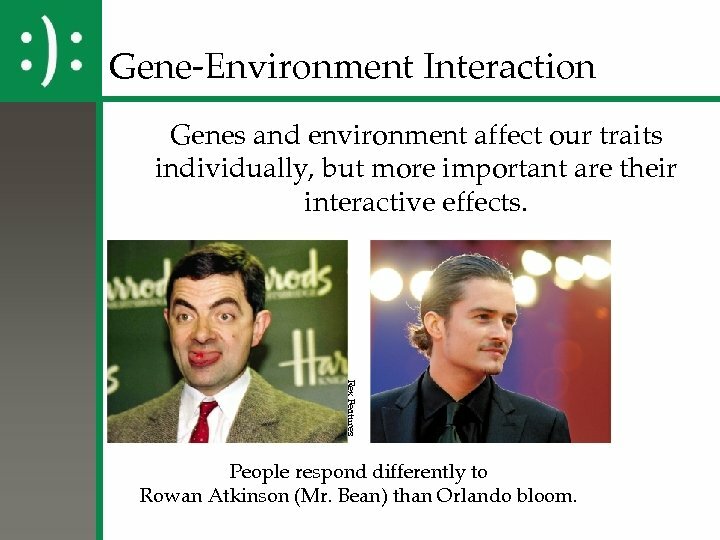 Gene-Environment Interaction Genes and environment affect our traits individually, but more important are their interactive effects. Rex Features People respond differently to Rowan Atkinson (Mr. Bean) than Orlando bloom. 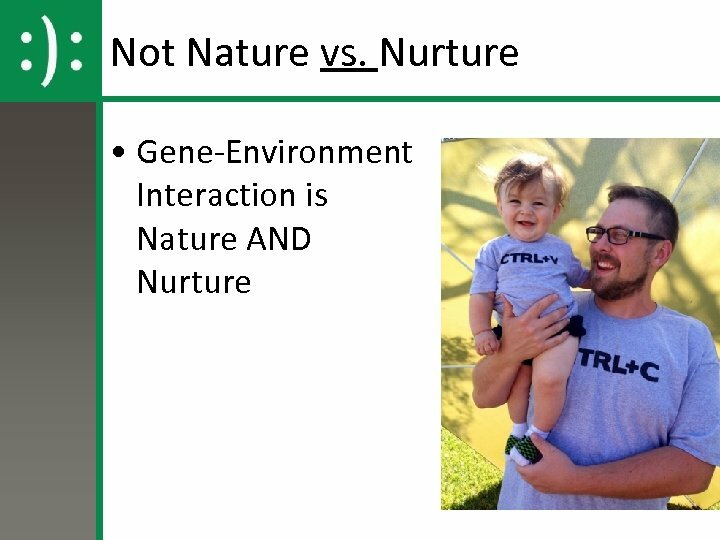 Gene-environment correlation • Passive - Bio-Parents directly pass on genes to their kids. 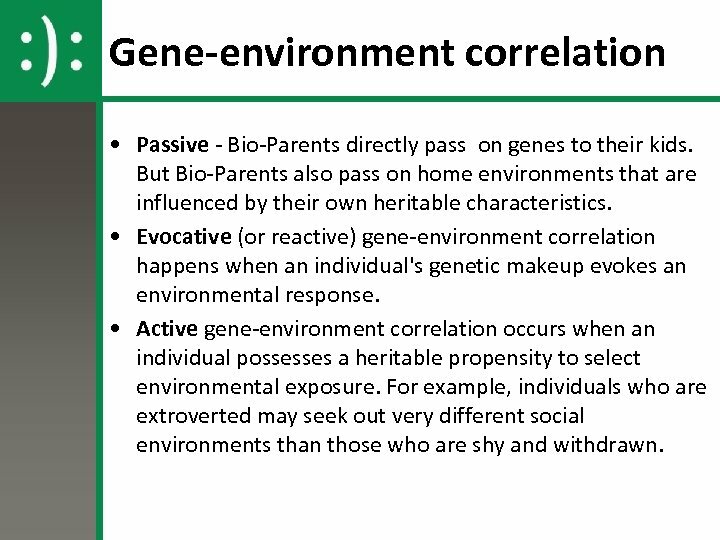 But Bio-Parents also pass on home environments that are influenced by their own heritable characteristics. 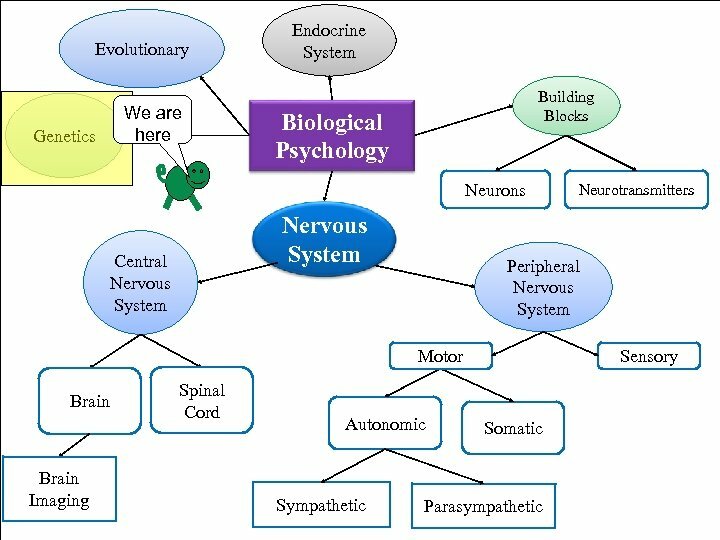 • Evocative (or reactive) gene-environment correlation happens when an individual's genetic makeup evokes an environmental response. • Active gene-environment correlation occurs when an individual possesses a heritable propensity to select environmental exposure. For example, individuals who are extroverted may seek out very different social environments than those who are shy and withdrawn.